So, I gotta find a way to have it ready to go any time. I am sure I am not alone in needing help to keep projects organized. 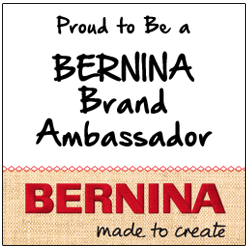 Pat Sloan was just talking about this in her blog about this in a blog about sewing de-motivation. So what are some techniques that can help me continue to make progress on multiple projects? Here are a few things I found around the web that may help those of us who need a little help in the organizing department. 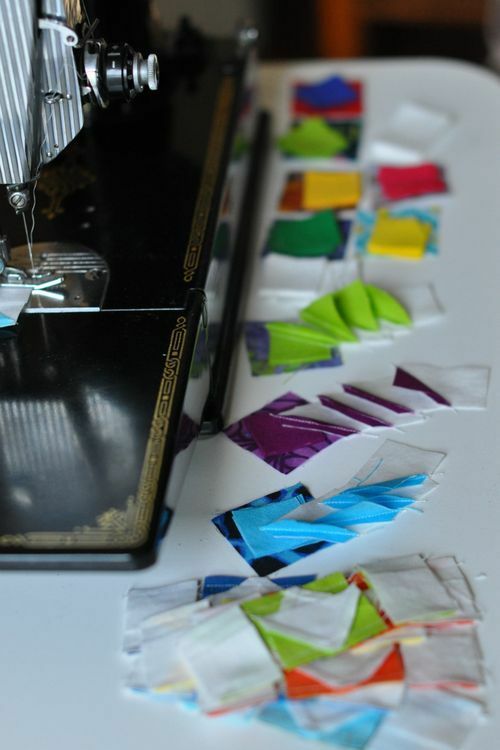 Author and quilter extraordinaire Lynn Harris sets up her featherweight near her kitchen with a single project, tiny scraps for her Twinkling Stars quilt. 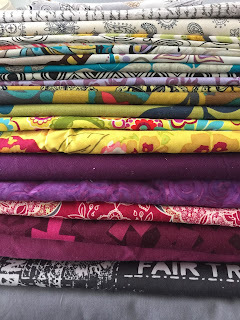 Bonnie Hunter has a ton of tips on her website Quiltville. My favorite is this ingenious use of a cutlery tray for strips. This would work great for a log cabin quilt, wouldn't it? Amanda Jean Nyberg designed a WIP (work in progress) bag to keep her projects straight. She sells the patterns here. I love this idea. These are so very pretty! A similar solution would be ziploc bags, but certainly not as pretty. 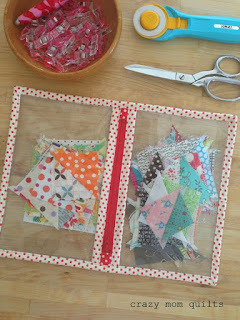 Amanda also has a great tutorial for making Storage Cubes. In her book Sunday Morning Quilts with Cheryl Arkison, they created color coded bins to sort scraps as you cut fabric. Pretty cool! 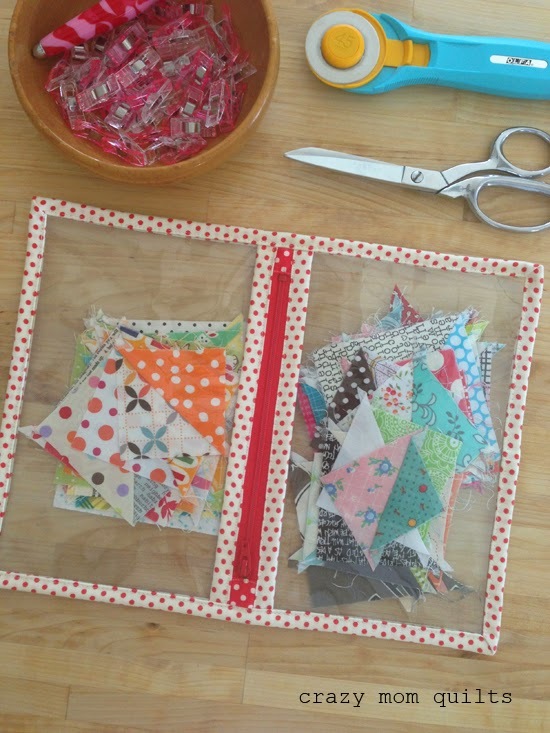 Pat Sloan has some great tips for using clear bins to cut up scraps into usable sizes. I have used this same technique for projects and it works great. Reader Therese Kay adds: "My house is so full of UFO's, it could be a space station. I don't sew or quilt - my Mom did that - but I inherited her creative gene and then got chronic Lyme. Add brain fog, fatigue, and achiness to a person who already had ADHD and a propensity for far too many ideas and too little time and you can understand the space station! In addition to zippy bags and baskets, I also use clipboards for papers associated to a project. One clipboard per project and I leave a note somewhere where I left off and what the next step is... When I remember to! 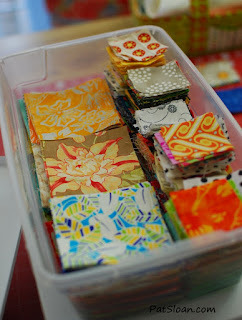 I love the fabric scrap tip - cutting to usable sizes! That can be applied to all kinds of supplies!" Do you have an organization solution that works for you? Tell me about it and I will update the post. Thank you Tracy for tackling the issues relevant to many people. 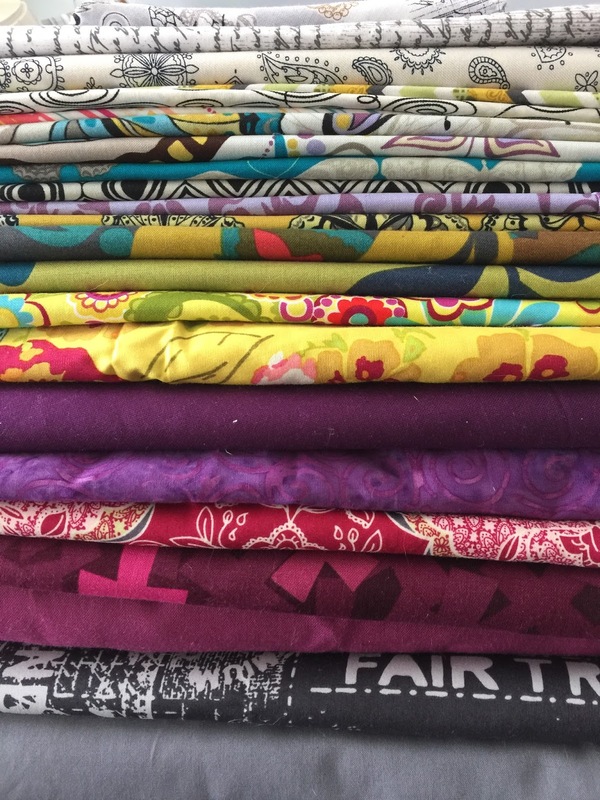 I too have pain and fatigue health problems but I want to continue my creative pursuits of quilting and sewing. I look forward to reading future blog posts. My house is so full of UFO's, it could be a space station. 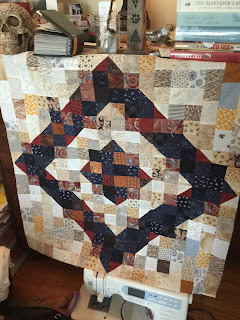 I don't sew or quilt - my Mom did that - but I inherited her creative gene and then got chronic Lyme. Add brain fog, fatigue, and achiness to a person who already had ADHD and a propensity for far too many ideas and too little time and you can understand the space station! In addition to zippy bags and baskets, I also use clipboards for papers associated to a project. One clipboard per project and I leave a note somewhere where I left off and what the next step is... When I remember to! I love the fabric scrap tip - cutting to usable sizes! That can be applied to all kinds of supplies! GREAT idea! I always forget where I left off. I will add this to the list.